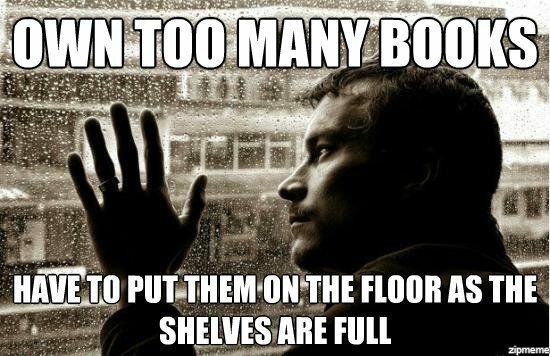 First of all, there is, sadly, such a thing as too many books. I fight against this truth. I rail against this truth. And then I look at the stacks and piles of books scattered around my house. There are books everywhere. Some of them are even on the seventeen bookshelves! But there are piles of books on my desks, on my dresser, my bedside table, the kitchen stool, the dining room table, on the floor, and even the bathroom sink. It’s a problem. So, what do you do when you have too many books? Well, you have to get rid of some of them. It just a fact. Ok, how do you choose what to get rid of? I go through my books fairly often (and yes, I still have that many scattered around). First, I look at whether or not I’ve read it. Yes: Will I read it again? No: Why not and how long have I had it? If I’m not going to read a book again, then that’s easy; into the pile it goes. If I haven’t read the book at all that becomes more complicated. I obviously picked it up for a reason. I thought it looked good. I wanted to read it. So, that’s where time comes in. If I’ve had the book for more than a year and I still haven’t read it, then it can go. If the urge to read it comes back (and I can remember what the heck it was), I do work at a bookstore. It’s not like the book will be gone forever, wiped out of existence the moment it leaves my house. 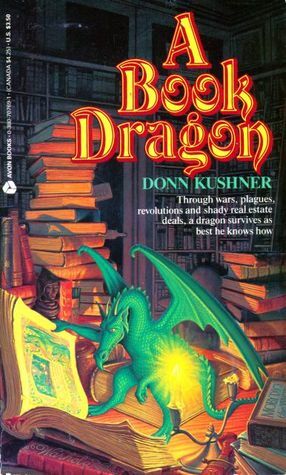 Even out-of-print books are available through the magic of the interwebs! Of course, all of this is the theory. In practice I manage to come up with some reason that I can’t sacrifice my precious, precious books. They’re mine! My books! My preciouses! Now, let’s assume you have a pile of books you need to get out of your house. What do you do with them. Not all used bookstores take the same things or even take books all the time (LP is currently not taking used books because we’re too full) so check before you haul all your books across town. Most libraries have a Friends of the Library store where they sell books to raise money. They’re usually not too picky about what they take and you can get a tax receipt for your donation. There are also thrift stores, literacy programs, VA hospitals, and various shelters. The local shelter for abused women is almost always happy to get books, especially anything that kids can read. 3. Host a book swap. This has the same problem as #1, but it can help spread books around your social circle. Maybe you have something that Tim really wants, but just can’t spring for right now. The nice thing about a book swap is that if there are leftovers you can still employ any of the previous suggestions. 4. Have a giveaway on your blog! Yeah, I’m sneaky. Sometimes I give you guys books that I’ve got built up around here. 5. Give them to your friends! We’ll discuss the giving of books as gifts in a later blog (the holidays are approaching with the inevitability of the Russian winter), but there is nothing wrong with giving a used book as a gift if you think the person will genuinely like it. I mean, as long as your cat hasn’t peed on it or something. So, those are a few ideas for what to do when you’ve got too many books. And tell me what you do in the comments!